Most marketers tend to focus on only one specific area and neglect to consider how print and social media complement each other in marketing. Social media is of course an important component of marketing nowadays, but it can actually be more effective when integrated with print communications. One of the key concepts of marketing is the establishment of a consistent identity over various channels, and recognizing how each complement one another in marketing is an essential step in ensuring that. In a concept called “integrated marketing”, you can utilize two or more seemingly divergent approaches–print communications and social media in this case–and utilize each one’s strengths in developing a broader and farther reaching marketing campaign. This will not only allow you to reach a wider audience, but also establish your brand as a reputable authority in your particular niche. In years past, online and offline marketing were previously seen as two separate disciplines. Given today’s more diverse and varied market however, the lines between the online and offline worlds have become increasingly blurred. Rather than focusing all your time, efforts, and resources on only one or the other, you might find it more beneficial to integrate the two into a more comprehensive marketing approach. 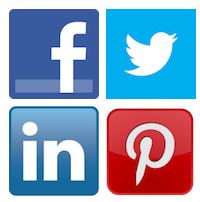 A popular way is including familiar social network icons in your printed materials as a way to encourage your audience to follow your social media pages. Designing attractive and captivating company business cards, brochures, postcards & catalogs to include these icons would be an ideal way to let new contacts know you have an active online marketing presence. Using Facebook, Google+, Twitter and Pinterest to promote new products and services, industry news and discount offers will keep them coming back. Whether on a trade show booth, point-of-purchase display or window decals, promoting social media pages is vital to your business marketing. Using your print communications is an ideal and additional way of achieving this goal. Today, marketing is all about engagement with your potential audience and providing them with something that is of actual value. If you can provide your audience with an experience by way of your social media campaign, integrating print communications will simply add to the value that you already provide. 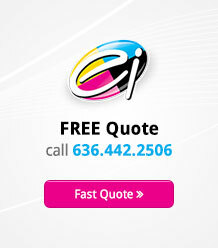 If you need ideas on creating a cost-effective print marketing plan, please contact Electro Image LLC. We will be happy to develop a solution that will enhance the results you need at a discount on several popular products that can compliment your social media marketing. We also assist businesses in creating eye-catch graphics for your social media pages.